The Twins are Blowing $4-6 M on Target Field ‘Upgrades’! 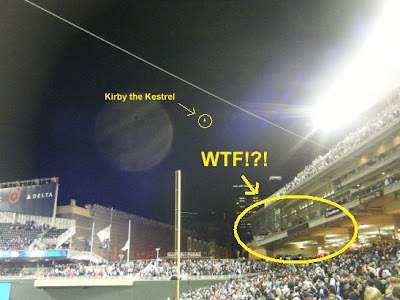 Most rabid Twins fans are already aware of the team’s payroll issues for 2011. With everyone (except Punto :( ) getting a big old raise, money is tight. However, money is apparently not tight enough to stop the Twins from blowing $4-6 million on “needed” improvements to Target Field. WTF!? - A second electronic scoreboard being added above the bleachers in right field, so all those fans in left field who weren’t paying attention can now see replays. - Even more Kramarczuks stands, to appease all those fans who boycott Schwigerts hot dogs due to them crushing their life long dreams of being in the Hormel Row of Fame (i.e. myself). - Providing fans with free wireless internet, so that they can sue you when you ‘disseminate’ descriptions and pictures of the game via Facebook without prior written consent of the Minnesota Twins. - Another creepy bronze statue of a player, to add to the current creepy statues of MLB Hall of Famers Harmon Killebrew, Rod Carew, and Kirby Puckett. (Coughnexthalloffamerbertblylevencough). Yeah, okay. If the Twins are just going to get swept again in the playoffs, we might as well do it in style. In all seriousness though, these sound like good changes—except the LED tower. I mean, weren’t the Twins just complaining about how the minimalist advertisement put up on the neighboring Target Center tarnished the view? Now they want to add a huge, phallic, light-up tower? In other news—how about that Joe Mauer? Another Golden Glove and Silver Slugger award.